Morbidity and mortality associated with Clostridium difficile infection (CDI) has grown considerably over the past few years. In the United States from 2000 to 2009, the number of hospitalized patients with any CDI discharge diagnosis more than doubled (from 139,000 to 336,600). In addition to the growing frequency of these infections, the severity of the disease has also increased, leading to greater morbidity and mortality. CDI has resulted in $4.8 billion in excess costs in US acute-care facilities, and this number will continue to increase as the incidence of these infections rises. The rising incidence of CDI is attributed to the emergence of a hypervirulent strain of C. difficile, with increased toxin production and high-level antimicrobial resistance. Furthermore, populations previously thought to be at low risk of infection are now being identified as having severe CDI, including those without any exposure to healthcare facilities. Fortunately, new diagnostic techniques have been developed to assist clinicians in the accurate and rapid detection of these infections. Additionally, new treatment options are available to clinicians for the management of initial and recurrent episodes of CDI. All healthcare professionals (HCPs) involved in the care of patients at risk for or with CDI should be aware of the latest approaches for the prevention, diagnosis, and treatment of this deadly infection. 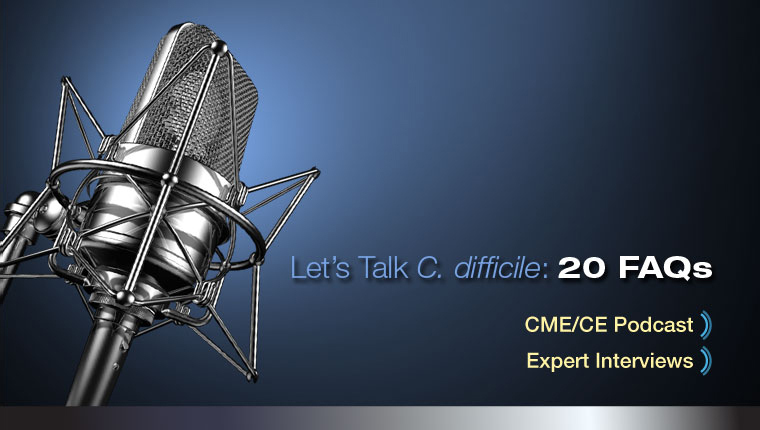 This educational 20-episode Podcast is designed to answer frequently asked questions about CDI and is an effective method to increase the knowledge and competence of physicians and pharmacists in the appropriate management of these infections. At the conclusion of this activity, physicians and pharmacists will be able to partner within an interdisciplinary team in ensuring optimal outcomes and safety of patients with CDI. Optimal management of CDI requires an interdisciplinary approach that includes all HCPs involved in the management of patients at risk for these infections. The activity is designed for physicians, pharmacists and other allied healthcare professionals on the frontline of managing patients at risk for or with CDI at their healthcare institutions. These include ID specialists, critical care physicians, internists, ED physicians, hospitalists, gerontologists, family physicians, and clinical pharmacists. Learning Activity 1: Center for Independent Healthcare Education designates this Enduring material for a maximum of 1.0 AMA PRA Category 1 Credit™. Learning Activity 2: Center for Independent Healthcare Education designates this Enduring material for a maximum of 1.0 AMA PRA Category 1 Credit™. Learning Activity 3: Center for Independent Healthcare Education designates this Enduring material for a maximum of 1.0 AMA PRA Category 1 Credit™. Learning Activity 4: Center for Independent Healthcare Education designates this Enduring material for a maximum of 0.75 AMA PRA Category 1 Credit™. Learning Activity 5: Center for Independent Healthcare Education designates this Enduring material for a maximum of 0.75 AMA PRA Category 1 Credit™. American Academy of Physician Assistants accepts certificates of participation for educational activities certified for AMA PRA Category 1 Credits™ from organizations accredited by ACCME. Learning Activity 1: Center for Independent Healthcare Education has assigned 1.0 contact hour (0.1 CEU) of continuing pharmacy education credits for participating in this activity. Learning Activity 2: Center for Independent Healthcare Education has assigned 1.0 contact hour (0.1 CEU) of continuing pharmacy education credits for participating in this activity. Learning Activity 3: Center for Independent Healthcare Education has assigned 1.0 contact hour (0.1 CEU) of continuing pharmacy education credits for participating in this activity. Learning Activity 4: Center for Independent Healthcare Education has assigned 0.75 contact hour (0.075 CEU) of continuing pharmacy education credits for participating in this activity. Learning Activity 5: Center for Independent Healthcare Education has assigned 0.75 contact hour (0.075 CEU) of continuing pharmacy education credits for participating in this activity. Complete the online Self Assessment, Evaluation, and Credit Application Form. Please note that to receive credit you must achieve a score of at least 80%. Dr. Gallagher does intend to discuss the off-label uses of metronidazole and nitazoxanide. Dr. Shah does not intend to discuss the off-label uses of any product. Copyright© 2013-2014 Vemco MedEd, LLC. All Rights Reserved. Permission for accreditation use granted to Center for Independent Healthcare Education.